This is a diagram of the organelles in a typical animal and plant cell. 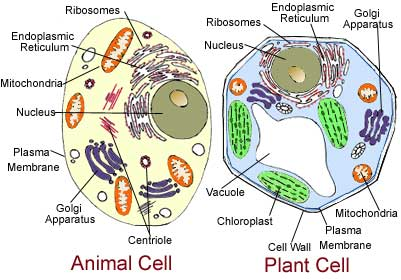 While there are some differences between the two types of cells, a plasma membrane surrounds cells in both plants and animals. A cell is the most basic form of life. Some living things are only made up of one single cell! However, many other living things are made of many cells, sometimes trillions. In fact, humans are made up of approximately 5 trillion cells. Within each cell, there are special parts called organelles that each performs a specific function within the cell. One such organelle is called the plasma membrane that surrounds the entire cell.The job of the cell membrane is to both separate the cell from what surrounds it and, most importantly, control what is able to enter and exit the cell. The cell membrane is selectively permeable meaning that only some things are able to enter and leave the cell easily. Some very small things are able to easily pass through the plasma membrane without the cell needing to use any energy to move it. This is called passive transport. However, there are many larger things that the cell needs to function correctly. These things cannot just pass through the membrane using passive transport; therefore, the cell needs to use some energy to move it through the membrane. This is called active transport. Image right: This is a drawing of the lipid bilayer of the plasma membrane. The lipid bilayer is made of phospholipids. Taking a closer look at the plasma membrane, scientists noticed that it is not just one layer around the cell. It is actually two! The cell membrane is made up of phospho lipids where part is hydrophilic (water-loving) and part is hydrophobic (water-repelling). This causes the phospholipids to be arranged in a very specific way with the hydrophobic tails facing inward and the hydrophilic heads facing outwards. You may have already heard the word model used before. However, here we are not talking about the pretty models that you see in commercials on television. Instead, when scientists talk about models they mean something meant to represent something else that is usually more complicated. A model can either show what something looks like or does in reality, or sometimes even both. Scientific models often look hardly anything like what it represents and this is very important for anyone using the model to remember. For example, if you were to examine a highly magnified picture of a molecule, it would look nothing like the models chemists construct from plastic pieces. The best models would maybe show something about what it is modeling actually looks like and what it actually does. So, if scientific models do not look like the thing they represent, then why do scientists use them? It is because models can help scientists and others better understand how something works usually by simplifying things and making what you want to demonstrate easier to understand. In this activity you will actually get to model something that is very hard to see, even under a microscope! Be careful when using the glue gun! It can burn. Prior to the activity, complete the following table with what the similarities and differences are between the common real things and their models. Then, try to think of and write down some things that can be better understood by looking at the model rather than the real thing. What could you understand better from the model than the real thing? Cut 10 elastic bands to the size of a popsicle stick. Glue four of the craft sticks together to make a square. On each side of the craft sticks, mark off every 3/4 of an inch from the inside of the square. Use these marks to glue the elastic bands to form a grid. Do not weave the elastic bands! Glue the remaining four craft sticks over the others. Finally, decorate your model if you have time! Make your plasma membrane work! Now try and drop the marbles through your model plasma membrane. Did you have to push them through? Do you think this demonstrates passive or active transport? Why? Now, try and drop the ping-pong ball through the model plasma membrane. Did it fall through? Try and push it through the membrane. Was it able to pass through now? Does this demonstrate passive or active transport? Why? What function of a plasma membrane does this model show? What function of a plasma membrane does this model NOT show? Is the model of a plasma membrane that you made look like the cell's real plasma membrane? How or how not? This is only one example of a model that you can make to closely examine a scientific concept. This particular model, however, is not one that scientists use very often. Some examples of models that scientists use more often are computer models (for example weather forecasting models), atomic models, etc. Research one of these other examples and examine how it is like the real thing it represents, how it is unlike the real thing, and how scientists use it. You can start by using the websites listed below under resources. Active and passive transport are both very important for the cell. Water molecules are very small and are able to easily pass through the plasma membrane by passive transport. This is important since if too much water is inside the cell, it could pop! However, some things that the cell needs to move through the plasma membrane are not able to easily move through. Therefore, the cell needs to use some energy and use active transport. Sodium and potassium are just two examples of things very important for brain cells that need active transport to enter or exit the cell!